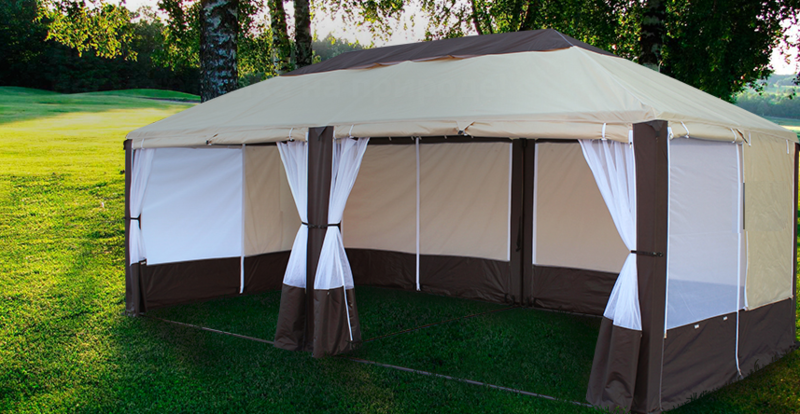 Comfortable tent with sliding mosquito nets is perfect for any occasion or relaxing in a big company, planned in nature. Reinforced frame tent made of steel, so the whole structure resistant to wind. All the parts of the frame are securely fixed to each other, and loop-delays allow firmly fix the tent on any terrain. An awning made of cloth, impregnated with a special water-repellent agent. Straps with buckles and zipper help you to pull the awning. At the top of the roof there is an adjustable vent.The tent is quite heavy, since the frame is made of steel. So shipping is quite expensive. We are confident that he will serve you not one year. Made in Russia. This tent is for those who values quality. Also it can be used as a tent for camping. Included is a waterproof floor.